Casa Iona is a lovely 2 bedroom linked villa situated in the beautiful Quinta-do-Paraiso Club, a 10-15 minute stroll from the picturesque Portuguese fishing village & beach of Carvoeiro. The family owned villa, which has been recently renovated to a high standard, has2 bedrooms, one with a 5 ft bed & the other with twin beds. Both bedrooms have large fitted wardrobes & are comfortably furnished. The bathroom, with traditional Portuguese tiles, has double sinks, a bath & an over-bath shower. The lounge has 2 comfortable sofas, a pretty wood-burning fireplace & dining area. The kitchen is well equipped with full size fridge-freezer, microwave, dishwasher & coffee-maker. If you are visiting in the summer air conditioning is available & there is heating if needed during the winter months. Patio doors open from the lounge onto an outside terrace where there is a table seating six – perfect for breakfast in the sun or a relaxing supper as you watch the sun go down. Parking is available. Carvoeiro: A 10 – 15 minute stroll (or one of Quinta-do-Paraiso’s regular shuttle mini-buses) will take you via a scenic coastal route to the friendly village of Carvoeiro with its abundance of little shops and lovely restaurants, suiting every taste and budget, where there is always a warm welcome for families. Carvoeiro’s beautiful horseshoe shaped sandy beach (where local fishermen still tend their colourful boats) is flanked by cliffs on either side and there are some spectacular restaurants overlooking the sea - a perfect spot to sample the seafood which is freshly available for a leisurely lunch or dinner. Carvoeiro is a beautiful village which has no high-rise hotels or large apartment blocks. Other local beaches: Whether its long stretches of sand or hidden coves with rock pools - you will be spoilt for choice in this part of the Algarve when it comes to beautiful beaches. There are many spectacular beaches close to Carvoeiro including Benegil (with its two very well-known seafood restaurants), Centianes and Algar Secos where the rock formation is ideal for snorkelling. Boats trips can be taken from Carvoeiro beach to other local beaches and rock formations and coves that are usually inaccessible from the land.• • • The surrounding area: As there are so many facilities within walking distance of the villa a car is not essential. If, however, you fancy venturing a bit further afield to visit one of the historic towns such as Silves and Lagos or to take a trip into the mountains and the spa town of Monchique. Carvoeiro is within easy reach of the harbour town of Portimao. We are happy to arrange car hire for you. In addition to the lovely on site facilities such as swimming pool, tennis courts, mini-golf, playground, table tennis and children’s club there are also numerous fun activities in and around Carvoeiro to keep children of all ages amused. These include a local horse-riding centre, Zoomarine (where you can swim with dolphins) and several water theme parks – all within a short drive. Cot available and high chair available on request. Smoking is only allowed outside! Children's toys and board games provided. I thought the apartment was in a lovely quiet position with lovely sunny outside space. But it is looking a bit tired (hence 4 stars and not 5) and I was very disappointed with the TV. I rented in the winter for over 6 weeks and did not want to go out every night. The television had very few UK channels, was extremely old with a constant buzzing noise and a line permanently across it. I would’ve considered this apartment for next winter but not with such a poor tv. On the plus side the heating was very efficient (another must in the winter). The washing machine was a bonus and it was warm enough to dry everything on the balcony. Quinta dos Paraiso is a lovely resort. The pools were super and with one heated I even managed a swim. It’s 15 minutes walk from the beautiful centre of Carvoeiro. Quiet, private and a very good location. Access to all goods and services. Really enjoyed our stay, apartment well equipped from the complementary food to get us started, with full laundry facilities and a fully functioning fireplace. David was a tremendous help and was always there to lend a hand. Would definitely stay again and highly recommend. Nicely furnished and you had a feeling of safety and security. We’re able to easily take many day trips and experience the western Algarve. We had a lovely 10 night stay in Casa Iona. David met us on arrival and showed us round. The house is well equipped and has a dish washer, washing machine and dryer which helps when you have a 1 year old. The terrace was great for sunbathing. The communal pools were good, plenty of sun loungers. The mini market on site sells plenty of holiday basics - alcohol, crisps, fruit etc but for a big shop the Intermarche supermarket was €20 return in a taxi. 15 minute walk into Carvoeiro, uphill on way back but we managed it fine with a pushchair. Quiet, relaxing very well equipped villa. Well equipped little villa in a very quiet location. We had a lovely relaxing stay at Casa Iona which was the ideal place for a week away. The villa itself is lovely and open and the whitewashed walls really help with the traditional feel. The actual site has excellent facilities, we especially made use of the pool area. The staff are also very useful and speak good English, they are particularly good with recommendations and can easily help suggest which boat or kayak tour is best. Only a 10-15 minute walk away from the villa are a number of pristine beaches, the highlight of them all of course being the main beach in Carvoeiro. There are some excellent restaurants nearby too serving great food at a superb price. We decided to hire a car which proved to be hugely useful. It helped us with transport from the airport, around a 1 hour 15 minute drive, it also helped us with getting around and exploring into Portimao and beyond. There were a number of good restaurants here and a beautiful beach, rock and pebble free, just consisting of white sand. We would also recommend a trip to see the caves as they really are quite a sight and are one of the things that the Algarve is apparently most famous for. We chose to see them by kayak which was a lot of fun, although it does rely quite heavily on the sea conditions and how much wind there is on the day. The villa is itself is well equipped also for just having a day in relaxing and cooking yourself, the fridge usefully also has a couple of things stocked which are very useful for breakfast on the first morning and possibly some leftovers for lunch too! All in all a fantastic holiday made possible by this villa at such a good price. Forget package holidays, this is the way to go! Casa Iona is located in the Quinta do Paraiso holiday resort in Praia do Carvoeiro. Casa Iona enjoys a peaceful setting yet is within a couple of minutes walk of the Club’s central facilities – these include a small, well-stocked supermarket (selling essentials like fresh milk, wine, fresh bread and pastries), well-known pizzeria, restaurant, coffee bar, playground, tennis courts, mini-golf and beautiful communal pools. There is also a renowned diving school and bike hire available on site. 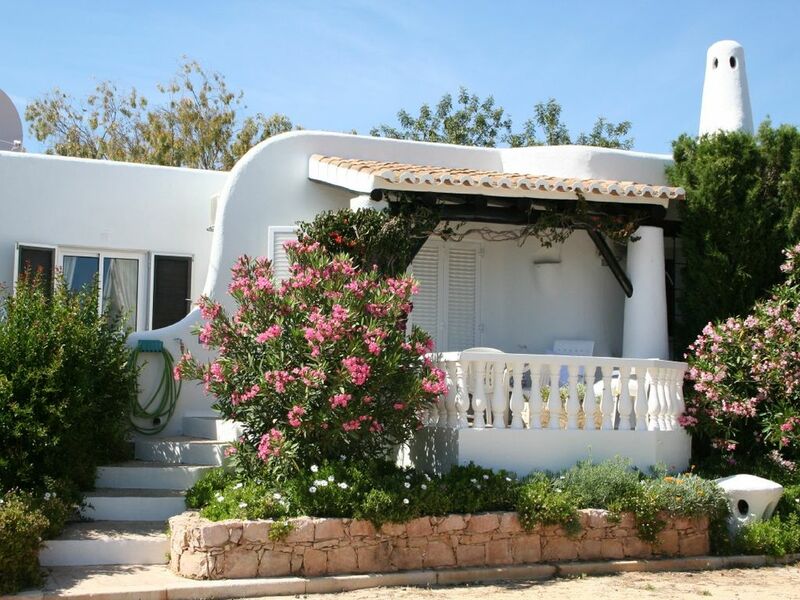 The drive from Faro airport to Casa Iona takes approximately 45 minutes. Golf: The area has excellent golfing facilities. You will find the Quinta do Gramacho golf course and a 9 hole course on the Vale do Milho development, both in Carvoeiro and the renowned championship golf course at Penina only about a twenty minute drive away. Slightly further afield are the golfing centres of Vilamoura (approximately 30minutes by car) and Vale do Lobo (40 minutes by car). There is an extra charge for the use of the air conditioning: 80€/week, optional in the month June, July and August. There is no charge for use of the air-con/heating between September and May maid service once per week is included in the price. To confirm your booking, we require a 25% deposit payment.